This Victorian theme vignette was a commissioned piece. Photo shown below was used to try to capture some resemblance of little girl in portrait. Santa is dressed in a 3/4 long caped coat in black/brown tweed wool, and black wool pants. He is tipping his hat to greet the little girl. His black top hat was hand-made with black wool and has a hand-stitched grosgrain ribbon around brim. He also wears a whiteshirt with dark red ascot at neck. Santa is seated on a wood & cast iron park bench under a lighted Victorian lamppost. The little girl is wearing a dark red velour dress trimmed in antique gold/red trim, also matching hooded cape trimmed in dark brown mink, with mink fur muff and handmade black leather boots. Her accessories include a tiny book called "Little Dorritt" from the Charles Dickens series, with real print inside, a pair of ice skates, and a tiny collectible porcelain doll from England. Santa is seated with his two puppies, a Jack Russell terrier and Black Scottie. Thank you Heather ! I really enjoyed making your special piece. This One of a kind Santa was a commissioned piece. He is a large 45" Santa. This Santa has a very kind expression with clear blue eyes (glass). He is wearing a beautiful long coat in beige (very soft) raised chenille. The coat has a long cape and is trimmed with beige/brown tipped real Fox fur with matching fur hat. His coat has a pretty braid loop trim at the bottom and also at the end of his sleeves. His under-dress is a silk polyester fabric in gold beige. The pants under his under dress is faux suede with suede boots in beige and trimmed with beige mink. He will be holding a walnut rosary, (not the black one in photo) so I made a copper color sash at his waist to compliment the walnut rosary. 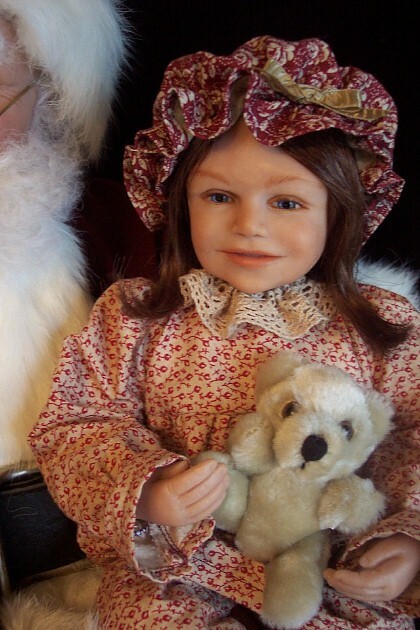 Look for photos in upcoming December issue of "Doll Reader"
"Mrs. Claus and little girl"
This One of a kind 22" Mrs. Claus with little girl was commissioned. Mrs. Claus is dressed in a snowflake pattern coat with white faux fur trim and lined ivory lace dress. She is seated on a pretty white scroll & leaf cast iron chair. One of a kind Little girl is approx. 12" tall. She is wearing ivory cotton dress with matching bloomers. She has a white faux fur coat over dress and matching fur head band. She holds a small antique style porcelain doll & pair of skates. Thank you Julie for letting me make this piece for you! "Santa Mo & Special Helpers"
This was a commissioned piece. Mo is approx. 24" and girls 16" and 12". Human hair wigs on girls, wool beard on Santa. Rabbit fur on Santa. My client wanted a special piece to hand down to her grand-daughters when they get older. This Santa "Mo" comes each year to their home at Christmas and she wanted them to have something to remember the special times at Grandma's. I am not a portrait doll artist, but I wanted to try to capture some resemblance if I could for her. Thank you Charlotte for letting me make this fun piece for you! Santa is approx. 26" and Mrs. Claus is 24". Mr. & Mrs. look lovingly into each others eyes. 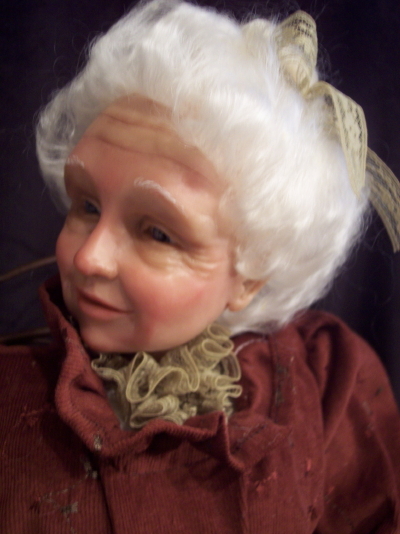 Both are ONE of a KIND handsculpted dolls. They are wearing matching cream/white brocade lined robes and cream color satin PJ's with slippers. Santa holds a gift for Mrs. while she leans in to give him a kiss. This fabric was so pretty --I decided to use it on two Santa's (see Santa below) This Large One of a kind formal Santa is approx. 38" tall. His head &hand are hand-sculpted using prosculpt. His eyes are glass and he has a long angora mohair beard. He wears a beautiful long heavy tapestry coat with cape done in very rich colors of deep red, warm browns & gold muted patchwork print. Coat & cape are trimmed with a off white faux fur and matching hat has a deep red tassel. His under dress is done in a pretty copper brown patchwork silk fabric. He also has a matching sash around his waist. Santa has brown leather shoes. Accessories include a small sled, small tree, and branch of evergreen, and large red berries. 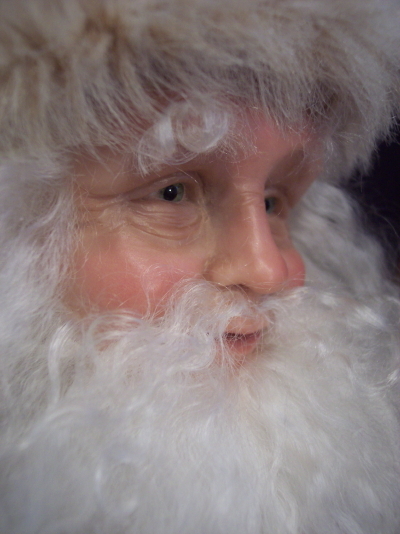 This One of a kind unique Santa is 24" tall (17" high seated) His head & hands are handsculpted using prosculpt. He wears a beautiful 100% ruffled silk shirt--done in deep red, sage green & gold print. Pants & hat are done in deep sage green & red stripe velour with antique gold tassel. He also has a matching antique gold tassel belt around his waist. Santa has black boots and holds a list of children's names from the 18th century. Accessories include: Black & brown Windsor chair, Very unique --vintage Old World globe 7" diameter with 9" x 11" wood stand and real brass magnifying glass. This One of a kind Santa stands approx. 24" tall. His head and hands are hand-sculpted using prosculpt polymer clay. His beard is made of white angora mohair. He has gentle blue eyes (made of fade resistant glass). Santa is wearing a very soft brown rabbit coat. His under-coat is made of brown faux suede, with wide black suede belt. His pants are made of a wool tweed in darker brown. His boots are black and he stands on a German glass glitter/snow covered board. His accessories are a pine cone & cedar branch and small teddy bear, also his companion gray donkey wearing side-bags of evergreen branches & berries.